One of the key premises of cascading style sheets, is that there is actually some cascading going on. In this article I plan on demonstrating how a data object [a class with properties] can be rendered using CSS3 as the main rendering engine, separate from the data itself. An Object and it’s properties will be represented via nested DIV’s. I found a terrific ‘Price Card Demo‘ that I’d like to show off as a warm up. It really is quite cool. Later we’ll change the HTML to implement the object/property concept. What I’d like to see different here is the pricing-table be a class. Should I really believe pricing table is a singleton? So lets change those #price-table styles. That was easy. The only trick is the first div, which needs to change. This will give you an identical display. 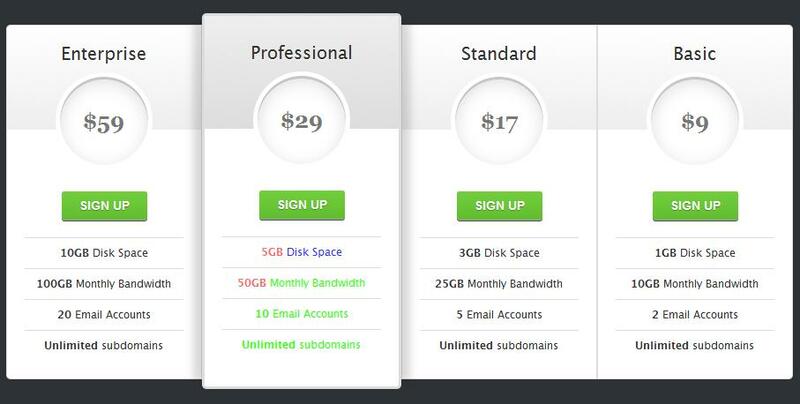 But now the pricing–table is a class. So now that we have an Object named ‘plan’ and a property named ‘bandwidth’ we need some CSS. So we can of course expand out the rest of the properties.